A weakened MK Dons side was well beaten by League 1 Luton Town on Tuesday night, going down 3-0 in the Checkatrade Trophy. First half goals from Alan Sheehan and Kazenga LuaLua put the home side in total control at Kenilworth Road, before Jorge Grant made sure of the result on the hour mark. 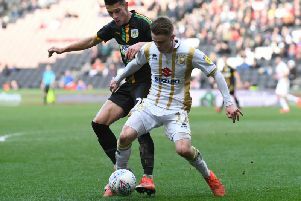 MK Dons' first trip to Kenilworth Road in 13 years saw Paul Tisdale make eight changes to the side which beat Cheltenham 3-0 at Stadium MK at the weekend. The sole survivors were Dean Lewington, Ryan Watson and Chuks Aneke in a largely youth-orientated side for the Checkatrade Trophy. League 1's form team, Luton were bright out of the box. Andrew Shinnie and Arthur Read both chanced their arm from range but didn't trouble Stuart Moore, who was making his return to Kenilworth Road after a stint there in 2017. But the keeper was left helpless when Luton took the lead from the penalty spot in 17 minutes. David Kasumu was beaten all ends up by Andrew Shinnie's quick footwork to give away the spot kick, with Alan Sheehan doing the duties from 12 yards. The much-changed Dons weren't entirely out-classed by their higher-league opposition, but allowed Kazenga LuaLua entirely too much time to line up his shot and bend it into the far corner 12 minutes later to double the Hatters' lead. From there, Dons never really looked a match for the home side. LuaLua was having a lot of joy down the Luton left, while the visitors were being over-run in midfield, with Kasumu guilty of giving the ball away far too often. Two of Tisdale's surviving players from Saturday were withdrawn at the break, with Dean Lewington and Chuks Aneke withdrawn with half an eye on Saturday, while Ouss Cisse picked up an injury on the stroke of half time too as the visitors made a triple change, bringing on Alex Gilvey, Brandon Thomas-Asante and Aidan Nesbitt. The Scot has barely featured this season, but should have pulled one back for the visitors seven minutes after his introduction when he got on the end of Mitch Hancox's cross only to fire straight at Harry Isted with his initial effort and then with the rebound. But their slim chances of a comeback were ended on the hour mark when Jorge Grant made it 3-0 after Stuart Moore made a decent save to deny Aaron Jarvis, only for the ball to pop up to the Nottingham Forest loanee. It could have been more as well, but Read struck the post when he was sent clear on goal, and Jarvis was only denied a fourth by a brilliant tackle from Finn Tapp.